There have been plenty of books about Queen—both official and unauthorized. Is This The Real Life? 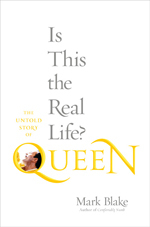 : The Untold Story of Queen falls in the latter, although author Mark Blake does draw from interviews from surviving Queen members Brian May and Roger Taylor —the rest is complemented by reminisces of former associates and friends. Die-hard, obsessive Queen fans probably already know most of the story about the band–who celebrates a 40th anniversary this year—so some stuff from the book may not reveal that much in terms of new details. Still Blake presents a more thorough and analytical view of Queen and their music–certainly more than the authorized and dated 1991 biography Queen: As it Began. It is still a fascinating, can’t put-down type of read of a band whose story is almost cinematic—we get to relive the triumph of “Bohemian Rhapsody”; the period of 1979-1980 when the band conquered America thanks to “Crazy Little Thing Called Love” and “Another Bites the Dust”; the adventures of touring South America; the band’s revitalization thanks to Live Aid; singer Freddie Mercury’s death in 1991 and the recent pairing of Queen and Paul Rodgers. The spirit of Freddie Mercury looms large through the entire book (how cannot it be) from his modest beginnings as a child from Zanzibar through his larger-than-life rock and roll person and wild backstage lifestyle, to his tragic yet resilient final days after being diagnosed with AIDS. In short, Almost every nook and cranny of the band’s history—including the members’ solo projects- are tackled here by Blake, who really presents it quite well with a somewhat objective point of view. For this special anniversary year, Is this The Real Life? Queen: The Untold Story is a solid read to look back and appreciate the things that made this band so unique and special.